Sixknot Cider is a small, organic outfit in a tiny town in northern Washington; I tried their Purple Sage apple/grape seasonal at the Seattle Cider Summit this past summer and was glad to see their stock at my local liquor store so I could give one of their regular varieties a try. High Desert Dry has a softness to its aroma, a hint of vanilla, more of the orchard’s wood than its apples. It’s cloudy amber and 6.5% ABV. The taste is light, kind of broad and airy. It’s a little tart, a tad acidic, but mostly woody and very, very dry. This reminds me quite a bit of Alpenfire’s Pirate’s Plank Bone Dry; drinking it gives me the same sense of (tasty) liquefied timber, though Pirate’s Plank is more dense, with a stronger flavor. I could see this being a good pairing for rich or strongly flavored meals — something to clear out your palate with. Locate yourself some Sixknot here. 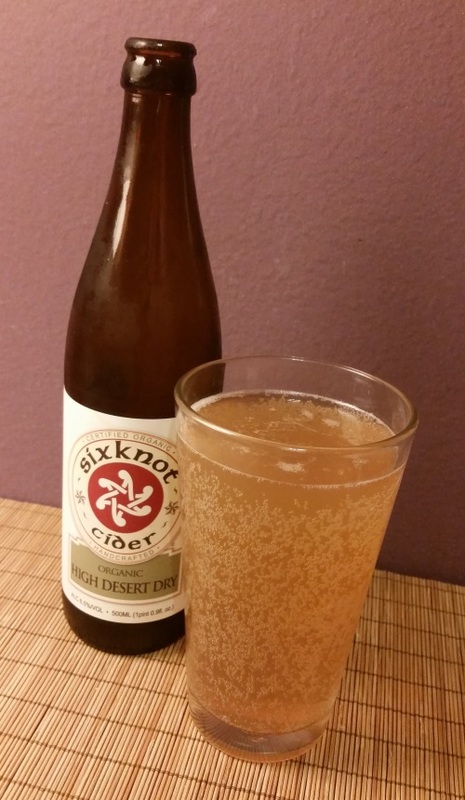 This entry was posted in Cider and tagged 500mL, high desert dry, sixknot cider. Bookmark the permalink.